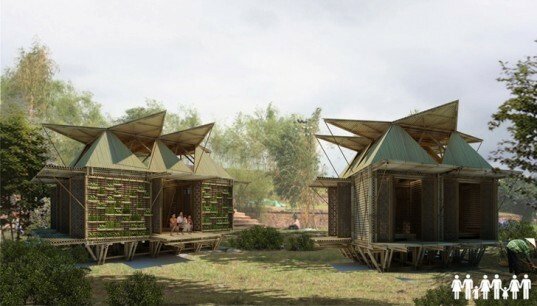 Vietnamese design firm H&P Architects is looking to a future of rising flood waters with their new design for affordable housing. 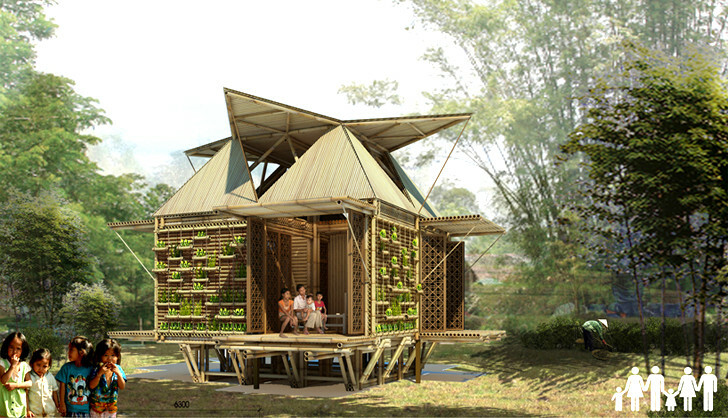 Made from sustainable local bamboo, the homes fight the severe flooding that is prevalent in Southeast Asia by rising and falling with the incoming waters. The thatched homes are built on platforms made from reused oil drums and kept in place with anchors, allowing the structures to float in place during flood season. Bamboo was chosen for the homes not just because it is plentiful in the region, but it is also versatile, durable as well as traditional. Bamboo frames, roofing and walls are arranged between long steel piles that secure the home during flooding, much like an anchored boat. The floor is elevated, which not only keeps animals out, but also makes room for a layer of recycled oil drums that serve as a float. H&P designed the roof to be both unique in form and function. Triangular cut outs open up in every direction, creating natural cross breezes and shade. Horizontal doors on either side of the house also open up, creating miniature patios and awnings. But when turbulent weather comes, these pieces can all be closed up, protecting the residents inside. Aside from storm protection, the homes also have suspended bamboo planters along their outside walls, which create vertical gardens for food. Rainwater harvesting systems are also in place, and have the ability to be shut off during severe weather. Each of the incredible homes can be configured to fix families of six or expanded to fit even more. Easily assembled on site, they cost around $2,000 each for a sustainable, safe dwelling. Bamboo was chosen for the homes not just because it is plentiful in the region, but it is also versatile, durable as well as traditional. Bamboo frames, roofing and walls are arranged between long steel piles that secure the home during flooding, much like an anchored boat. The floor is elevated, which not only keeps animals out, but also makes room for a layer of recycled oil drums that serve as a float. H&P designed the roof to be both unique in form and function. Triangular cut outs open up in every direction, creating natural cross breezes and shade. Horizontal doors on either side of the house also open up, creating miniature patios and awnings. But when turbulent weather comes, these pieces can all be closed up, protecting the residents inside.